Tourney time brings out the best in Penn Boys Basketball point guard Drew Lutz. Last season, as a sophomore, Lutz scored 23 points in a triple-overtime thriller against Elkhart Central. Lutz scored a stunning lay-up on a fearless buzzer-beater drive to push the game into the third overtime. On Tuesday night, Lutz stunned Mishawaka with an electrifying eight-point flurry in the final 35 seconds of the third quarter. Penn erased a 34-31 Mishawaka lead to grab a 39-34 lead. 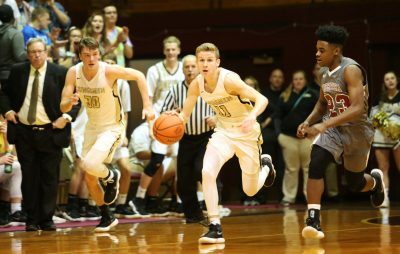 Lutz then helped the Kingsmen finish off the Cavemen, 52-48, as Penn avenged a 55-50 regular-season loss to Mishawaka and advanced to Friday’s Sectional semi-final game against South Bend Riley. Lutz led Penn with 17 points against Mishawaka. A 6-foot-2 junior, Lutz averages 16.0 points and 7.0 assists a game. He leads the team with 48 three-pointers and 52 steals. Lutz came off of the spectacular game in last season’s sectional game against Elkhart Central determined to step up his game. “Some things I have specifically worked on this off-season was becoming a better shooter, my ball handling ability, my court vision, and my ability to finish at the rim,” Lutz said. Lutz said he wants to make an impact on more than the basketball court. “I need to be a leader on and off the court,” Lutz said. Bringing the team leadership was also a point of emphasis for Lutz. Lutz comes from a basketball-oriented family. His two sisters, Taylor and Ashley, were both stand out Basketball players at Penn. His brother Ryan was a phenomenal basketball player at Penn. Lutz said that his older siblings helped him hone his basketball skills.